EDISON, NEW JERSEY (JANUARY 10, 2017) – The SANINEUTRAL® neutralizer kit from Saniflo incorporates neutralizing granules to increase the pH of acidic condensate water produced in residential or commercial applications before it reaches the sewer line. Condensate produced by boilers, water heaters, air conditioners and other appliances moves through the compact SANINEUTRAL, which neutralizes it to prevent the corroding of drains and sewer systems – damage that could otherwise prove extremely costly to repair. Neutralization is especially necessary for modern, high-efficiency appliances that produce higher-than-normal acidic condensate. Left un-neutralized, this condensate can not only corrode piping systems, but contaminate groundwater and even degrade the local water infrastructure. The damage could quickly negate the energy savings yielded by these high-efficiency products. SANINEUTRAL can be used in two main scenarios. The first is without a pump, where the acidic condensate simply needs to drain through gravity. 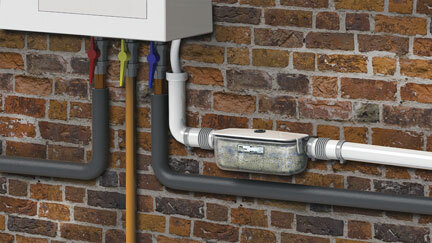 The second is in conjunction with a condensate pump, such as the SANICONDENS BEST. Commercial applications in which the BTU inputs of appliances are higher and the condensate is more concentrated are ideal for this latter option, where supplemental neutralization might be necessary. In either case, the SANINEUTRAL can rest on the floor, base or be wall-mounted. Appliances with higher BTU inputs may require even more neutralization. In these instances, the SANINEUTRAL can be installed in series for increased performance. 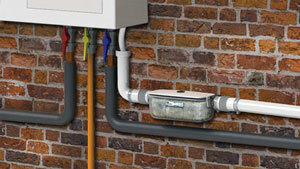 Simple to install, the SANINEUTRAL is also competitively priced. A starter pack of neutralizing granules comes with the unit. Replacement of the granules depends on the level of incoming acidic condensate over time. Checking for granule discoloration or using a pH level strip to test granule effectiveness will indicate when replacement is necessary. Granules are easily replaced by opening the top of the unit. No dismounting is necessary. The SANINEUTRAL neutralizes condensate produced by many modern, high-efficiency appliances, preventing pipe corrosion and other lasting damage. The SANINEUTRAL's neutralizing granules increase the pH of acidic condensate water produced in residential or commercial applications before it reaches the sewer line.